Yes! You can Connect these LEDs to any track power source. These solid non-flashing LEDs will look great with 7-19 Volts of power input. Guaranteed to stay lit for 2 years with free replacement. Thousands and thousands of these LEDs are now in use, on all types of track and transformer power supplies. Our LED Lights can be used for Locomotive Headlights, Passenger Car Lights, Ditch Lights, Yard Lights, Building Lights, and much more. 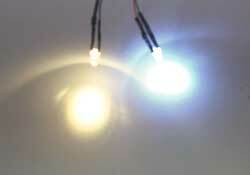 Low heat super bright LEDs only draw a tiny amount of power: 20milliamps. Choose your colors, we have warm white, cool white, red, orange, yellow, green, blue, and violet. Deciding which white to get? Our Warm White LED closely matches the warm glow of incandescent lighting. Use warm white for most locomotives. Customers tell us our Warm White is a good match to the original Lionel Headlight. The Cool White LED has cool cast, much like fluorescent lighting. Consider cool white LEDs for newer diesel locomotive headlights. 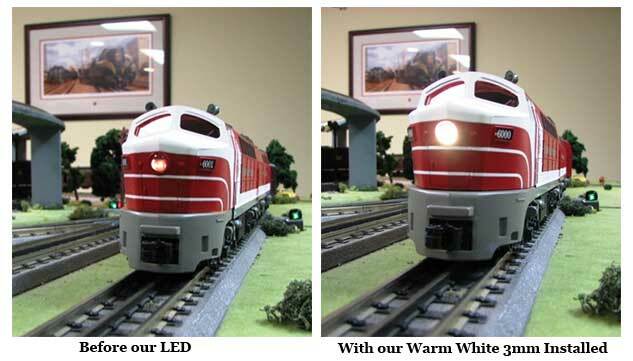 LEDs for Model Railroads, a Video! We have already added the Bridge rectifier, the correct capacitor, and the resistor. You just connect to your track power! You will notice both leads on these LEDs are black. That is because the polarity does not matter. The bridge rectifier takes care of this. Connect "either way" you are covered. These LEDs are not meant for connecting directly to the DCC decoder boards which operate at lower voltages. See the rectifier unit up-close! "I have never done a LED upgrade, it was easy, no drilling or soldering. Thank you!" "I went to work on one of my locomotives last night, and the results with an LED headlight are amazing. I'm looking forward to working on more projects using your products. I'm sure I'll be placing another order in the fairly near future." "Thanks again - GREAT lights -- I don't think I'll ever use any other." "I am placing another order tonight for more lighting kits and this is how I am going to light all of my locos in the future. " "Really Love these LED's ...... Happy to tell my friends ...... will re-order soon." "Just writing to let you know how happy I was with your LED Lights... I was very pleased at how the car turned out. The engine will be getting a lot more time on the track now that it is all lit up (LOL). The wheels have really been turning on where I can add more LEDs on some other cars. " "Very happy with your products"
"thank you very much for the excellent service...believe me I will be ordering more lights as my project expands! Also, I really like the new design with the device located a bit away from the LED...much easier to install in tight places." "I have ordered twice from you and your products are good and prices are very reasonable and your shipping costs are reasonable and the cost of shipping is very fair. I recommend you to anyone I know who is into model railroading. We will do business again. Thanks."